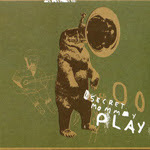 Plays operates according to a single restriction: No electronic instruments were used in its creation. Dixon and a revolving cast of supplementary musicians recorded improvised performances on guitar, woodwinds, horns, and strings, then Dixon cut and pasted these recordings into his usual neon scrimshaw. "String Lake" harnesses sprightly acoustic guitar loops, chirpy strings, and moistly sputtering percussion into a hyperactive bounce, while on "Grand About the Mouth", a threnody of falsetto harmonies, mellow woodwinds, and epiphanic whistles wends euphorically around sharp flecks of guitar. Cheery horns cut clean figures through the brambly stammers of "Diciduism". This template extends to encompass the album-- minutely sculpted rhythm tracks flicker frantically as bright, breezy melodies are sketched out broadly.